What lurks beneath the dusty red surface of Mars? NASA’s InSight Lander is launching next spring to go delving deeper than ever before as the first Martian geophysicist. Where the Curiosity Rover was NASA’s first true robotic geologist, the InSight Lander is branching out as a robotic geophysicist. The lander’s primary purpose is to learn as much as possible about the interior of Mars while staying safely at the surface. It’s doing this with an array of geophysical instruments including a deep probe penetrating further below the surface than attempted by any other robot on the planet. One of the truly exciting things about sending a geophysicist to Mars is how different the planet’s structure must be from Earth. While both small, rocky planets have a brittle crust and a gooey interior, Mars lacks the plate tectonics that constantly churn our home planet. With a bit of luck, this simpler scenario will give us a better idea of how small, terrestrial planets form. The general layout of the lander mimics the successful Phoenix Mars Lander that investigated the Martian north pole in 2008. 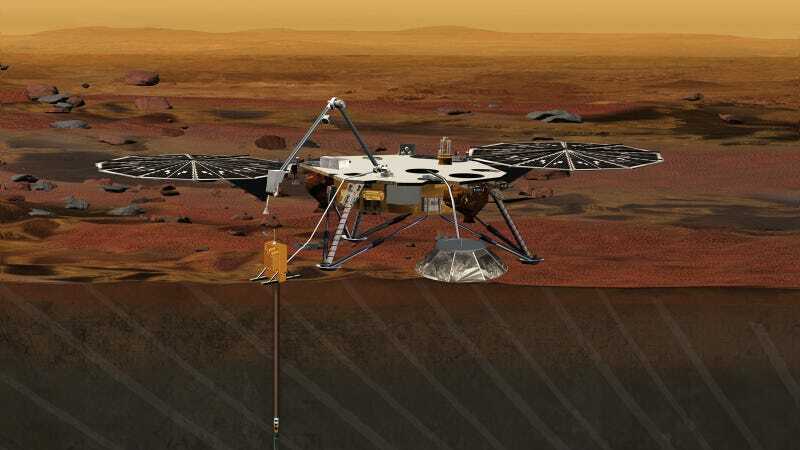 InSight will deploy two probes: a seismic station that will sit on the surface, and a heat flow probe that will hammer itself several meters into the ground. Seismology is the practice of using seismic waves (low-frequency acoustic waves that are triggered artificially, or by earthquakes or impact events) to measure physical properties of the subsurface by measuring the difference in arrival times between the faster-moving P-waves and the slower S-waves. On Mars, this means we hope InSight will give us the data to understand the thickness of the crust, the composition of the mantle, and the size, composition, and physical state (liquid or solid) of the planet’s core. A dedicated seismic station will also allow us to track the present level of tectonic activity (if any!) and the meteorite impact rate on Mars. The heat flow meter will hammer itself 3 to 5 meters (roughly 16 feet) into the Martian ground, monitoring heat from the planet’s interior and how it changes over time. Ideally, both seismic and heat flow techniques are better if measurements can be taken simultaneously at multiple locations since they have so much spacial and temporal variability, but InSight will be adapting single-station techniques used on Earth to make it work anyway. Finally, after years of indirect observations and guesswork, we’ll have better data to constrain what the inside of Mars looks like! The mission will also monitor the lander’s radio signal to measure wobbles in the planet’s rotation (helping determine if the core is liquid or solid), cameras for local observations, and a suite of environmental sensors, and tools to measure fluctuations in the magnetic field. The mission is expected to produce over 29Gb of data per year. The lander is headed for Elysium Planitia, a smooth, flat terrain with very few rocks identified from orbital images. The 130 kilometer (81 mile) long, 27 kilometer (17 miles) wide landing ellipse was selected for having the largest portion of smooth terrain compared to cratered, etched, or other unfriendly landscapes. The launch window opens on March 4, 2016 for the first Mars mission to blast out of California. Assuming it leaves Earth before the window closes on March 30th, the lander will slam into Mars just six months later on September 28th to set up in Elysium Planitia. The lander is expected to deploy its instruments within approximately 60 sols (Martian workdays), with the primary mission extending for 708 sols until September 2018. InSight is the 12th of NASA’s Discovery-class missions. The cost-capped solar system exploration missions have highly focused scientific goals. InSight was one of 28 proposals submitted in 2010 capped at a total cost of $425 million (excluding launch). It was one of just three downselected for preliminary design studies in 2011. The two other proposals that competed with InSight were for missions to a comet, or to Saturn’s moon Titan. Projects under consideration for NASA’s next Discovery mission possibly launching in 2021 include a visit to a metal asteroid, or an in-depth mapping of Venus.